The idea that love fulfills the Law is not unique to this passage. The phrase occurs often enough and is stated clearly enough that everyone "agrees" with the phrase. The challenge comes from understanding what is meant by fulfilling the Law; this is where the variation in teachings comes into play. The flaw in the reasoning of this lesson is that same one that has plagued the authors in previous ones, the authors assume that there is a relationship to the Law that must be delineated. The need for inserting a relationship to the Law stems from trying to force the content of this book to fit within SDA theology. SDA theology defines that the keeping the Law of God is a necessary condition of being among the saved at the end of time; therefore any Biblical accounts that would indicate that the Law cannot serve this role must be re-invented to fit the The Great Controversy theme. This is an example of how the Ellen White inspired world view (The Great Controversy) influences all SDA understanding. At this point any well-trained SDA should be thinking that Rev 12:17 tells us that the remnant "keep the commandments of God" and that Jesus specifically said, "If you love me, keep my commandments (John 14:15)". But in this case, Adventism does not let Scripture define what Scripture means. If you continue reading just a few verses further in John, Jesus describes exactly what He means by "my commandments"; "This is My commandment, that you love one another, just as I have loved you." (John 15:12 NASB). The lesson creates a definition for "fulfilling the law" that isn't based on the context of the passage, the meaning of the Greek, or the use of the phrase in other places. In fact, no basis is given for this definition, it is simply presented as the true one. So where Paul condemns those "doing the law"; the authors insist that what is required is "doing the Law" plus more than just outward obedience. This warped reasoning turns Paul's message upside down. Now instead of condemning those trying to do the Law as a) setting out to do something impossible, and b) setting aside Christ's completed work in favor of their own actions; the authors want SDAs to believe that they need to do more than just obey the Law. If that is the case, then it is an even further setting aside of Christ's completed work. As the lesson says, "This is not to imply that those who have found salvation in Christ do not obey." 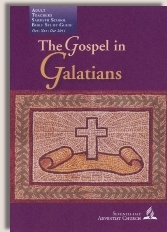 Where the real message of Galatians departs from the SDA re-interpretation is what a Believer is asked to obey. The lesson suggests that it is a different type of obedience to the same Laws. Paul has rendered that argument invalid through his teaching on the Law itself during the last two chapters. Abraham doesn't have a different type of ongoing "relationship" with Hagar, he is commanded to cast her out. And that analogy is given to Believers in Galatia regarding the Law. Yet SDAs are trying to keep Hagar around. The lesson claims that love fulfilling the law "is not an abandonment of the law, nor a reduction of the law only to love." In one sense that is correct. The Law given in the OT is not changed. What has been changed is what law the Believer is living under. With the change in covenants from old to new, there came a change in priests (Levitical Priests to Jesus, a non-Levite, as our only High Priest) and a change in Law (Heb 7:12). When the covenant is given it cannot be changed, if it were changed then God would be breaking His promise. So in order to have any change in the contents, the entire covenant has to be ended and replaced by a new one. The only way that a covenant can be ended is with the death of the one making the covenant (see Rom 7:1-6), which is exactly what occurs with Jesus on the cross. Which opens the door to an entirely new covenant. Obedience to a covenant that no longer exists makes no sense. The obedience that Christ seeks is an obedience to the New Covenant. Being freed from the Old Covenant Law does not mean there is no longer any guidance or instruction for a Believer to obey. SDAism; however, creates a false situation where the only two choices appear to be obedience to the Old Covenant Law or antinomian licentiousness. The lesson states this false dichotomy "without love, the law is empty and cold; without law, love has no direction." But Paul presents a third way, the way of the New Covenant and Spirit-filled living. Later in this chapter Paul outlines to results of this third way in the Fruit of the Spirit. Love doesn't need "direction" as this lesson claims. That is merely a poor attempt to re-establish the Law as the central point. If love sees a stranger in trouble (perhaps someone robbed, beaten, and left on the side of the road) what is the natural "loving" reaction to this? What Law is needed to know that the loving thing to do is to stop and help? A love-based response fulfills and even exceeds any response that might come from the Law. The Law isn't needed to direct that behavior; love, given by the indwelling Spirit, provides all of the direction necessary. Which of the 10 Commandments did the priest and the Levite break by passing by the man on the road between Jerusalem and Jericho? Can you obey all of the 10 Commandments without having any love for your neighbor? For instance, do you have to love your neighbor in order to not steal from him? The lesson tries hard to present the false reasoning that there are only two options, following the Law, particularly the 10 Commandments, or running amok fulfilling all of your carnal desires. If these were the only two options, then the moral answer would be simple, following the 10 Commandments is clearly the better of those two choices. But that is not the choice presented here (or anywhere in Scripture). Paul has gone to great lengths to demonstrate that following the Law is not a valid choice for Believers, instead Paul presents us with following Christ, resulting in a life of loving service, flowing from a love than comes from outside of ourselves.